Michael plays the Custom Alto YAS-875EX, Custom Soprano YSS875EX and YTS62 Tenor. "The Yamaha 875EX Custom saxophone possesses a superior quality and craftsmanship that enables all of the expressive qualities and colours of the music to come to life. No matter what the musical setting is, I always feel confident that the reliable intonation and projection of tone inherent in the Yamaha saxophone will allow the music to shine." Born in Melbourne, Australia, Michael Duke completed his Bachelor of Music degree with honours at Melbourne University's Victorian College of the Arts under the instruction of saxophonist Graeme Shilton. He received both Master's and Doctorate Degrees in Music Performance from Indiana University studying under the tutelage of renowned classical saxophonists Eugene Rousseau, Thomas Walsh, Jean-Yves Fourmeau and Arno Bornkamp. His doctoral document is entitled "The Saxophone in Chamber Music Since 1980: An Annotated Bibliography of Original Works." While pursuing jazz studies at Berklee College of Music in Boston, Massachusetts, Duke studied with Shannon LeClaire, Jim Odgren and George Garzone and performed in the ensembles of Phil Wilson, Greg Hopkins, Victor Mendoza, and Joe Lovano. Throughout the United States and abroad, Duke has engaged in an extensive performance career. He has performed with many of Australia's premiere orchestras including the Melbourne Symphony, Orchestra Victoria, the Australian Philharmonic and Pops Orchestra, and the Australian Chamber Orchestra. In the United States he has performed with the Owensboro Symphony Orchestra (Kentucky), the Camerata Symphony Orchestra (Indiana), the Columbus Indiana Philharmonic, and the Cedar Rapids Symphony (Iowa). 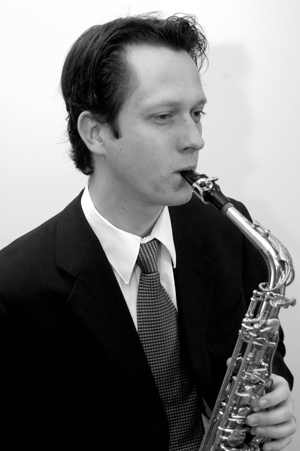 In the spring of 2002 Duke won the Indiana University Woodwind Concerto Competition for his performance of Jacques Ibert's "Concertino da camera" for alto saxophone and orchestra. On the national and world stages he has been invited to perform at the past four bi-annual North American Saxophone Alliance National conferences, two World Saxophone Congresses, and has lectured at the Australian National Band and Orchestra Clinic. As a freelance musician in the Boston area, Duke has backed such varied artists as Gloria Estefan, The Four Tops, Bill Cosby and Gary Burton. He has also performed with the Danilo Perez Big Band, the Jim Widner Big Band, and the Greg Hopkins Big Band. As well as teaching an extensive private studio, Duke is an active clinician and tutor. At the tertiary level, Duke has taught on the faculty of Simpson College in Iowa (2002-2005), Eastern Nazarene College in Massachusetts (2007-2008), and as an Associate Instructor at Indiana University in Bloomington, Indiana (1998-2000). He has recently accepted the position of Lecturer of Music (classical saxophone) at the Sydney Conservatorium of Music, Sydney University, Australia.